It’s standard—if a little lazy and expected—to write about Irish pubs and eateries during the lead-up to Saint Patrick’s Day. We all do it; I’m guilty, too. So, this week I decided to do something if not exactly daring, at least not totally predictable, either: Focus on MacCool’s Public House five months before St. Paddy’s Day. The reason? Well, there’s a new MacCool’s in Ogden, albeit one situated in an old, historical location: the Ben Lomond Hotel. Constructed in 1927 and opened as the Bigelow Hotel, the Ben Lomond is an example of Italian Renaissance Revival architecture, a style that was quite unique for Utah in the 1920s. The recent addition of MacCool’s provides a different type of renaissance, bringing fun-seeking, energetic, bustling crowds of diners and drinkers into the otherwise mostly staid hotel. 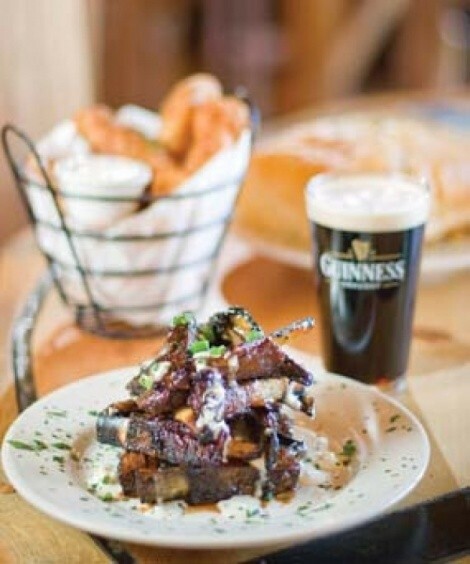 Each MacCool’s—there are also locations in Salt Lake City and Layton—is simultaneously similar and one-of-a-kind. They are not cookie-cutter restaurants, although all feature in common faux-stone walls, beachwood chairs and tables, plenty of room to roam and lots of bric-a-brac. The latter—vintage posters and artwork, kitschy beer, oil and milk cans and the like—all come directly from Ireland. But my favorite feature, which all three MacCool’s have in common, is the classic American shuffleboard table that, at the Ogden location, is front and center in the restaurant—right where it oughta be. I’ve had friends eschew MacCool’s, saying, “I don’t like corned beef & cabbage or shepherd’s pie.” Well, while MacCool’s certainly offers traditional Irish fare, I’d estimate that less than 10 percent of the menu is Irish. For example, if you think MacCool’s is all about heavy, Irish eats, you don’t know about the 17 salads, which range from classic Caesar ($5.99) or curry chicken ($8.99) to a roasted-beet salad ($7.99) and a steak salad ($12.99). One of the more interesting offerings is the “Su Tallinn” (Gaelic for strawberry) salad, which is a mix of spring greens with fresh strawberries, blue cheese and candied walnuts, drizzled with strawberry vinaigrette ($8.50). I’m hopelessly addicted to the Denver-cut rack of lamb spareribs ($13.99), which are slow-roasted before being char-grilled and served with MacCool’s signature barbecue sauce (from a family recipe of co-owner Scott Schlisman, whose family operates popular restaurants in the Philadelphia area) and melted blue cheese. For a lighter meal starter, P.E.I. mussels ($8.99)—about 15 of them—come bathed in a hearty marinara sauce with thick chunks of grilled toast alongside, perfect for soaking up extra sauce. Homemade gravlax—house-cured salmon served on a warm potato cake and topped with sour cream ($10.50)—is another appealing appetizer to share. It’s always hard for me to resist the corned beef & cabbage ($12.50); the corned beef is simmered slowly at a low temperature until it’s oh-so-tender and tasty, then served with cabbage, potatoes and carrots. However, a newer menu addition also promises to become a MacCool’s classic: seafood cakes ($14.99). Another Schlisman family recipe—this one from Schlisman’s chef brother—these are two large pressed cakes made with big chunks of spiced tuna, salmon and shrimp, served over mashed spuds with green beans. I love that these seafood cakes are all about seafood, not breading or other fillings. Fish lovers will also enjoy the huge, boneless trout filet that’s marinated in olive oil, garlic, basil, thyme and shallots before being char-broiled and served with warm spinach leaves and grilled potato wedges ($14.50). Recently, I tried my first-ever boxty (bacstai or aran boct ti, in Irish, according to MacCool’s). This is a traditional Irish potato pancake, filled with choices of ingredients. At MacCool’s, boxty variations include Mulligatawny, Hunter’s (buffalo, venison and sausage), smoked salmon and potatoes, or my choice: corned beef ($8.99). The pancakes are made with a mixture of boiled, mashed and shredded potatoes, rolled out into what resemble tortillas, then stuffed like a burrito with the aforementioned ingredients. Mine was a large serving (far too large to finish) of rolled potato pancakes topped with creamed corned beef, cabbage and carrots. It’s a hearty, warming dish that’s perfect for winter weather. Pints of cask-conditioned Tetley’s or Guinness are the perfect accompaniment for good old fish & chips ($12.99). A generous portion (four hefty pieces) of ale-battered fresh cod was fried to perfection and served with cottage fries, which turned out to be similar to potato chips: thinly sliced potato rounds, deep-fried. Unfortunately, the fries were about half crispy and perfectly fried, and about half chewy, tough and undercooked. There’s a quality-control issue at the kitchen’s fry station. MacCool’s has a couple of special events coming up, including a “Locals Salute Airmen” benefit auction and Wasatch Brewery dinner for Hill Air Force Base airmen and families, on Thursday, Oct. 27 at the Layton location. There will be complimentary appetizers during the auction-item viewing period and a five-course feast featuring Wasatch pairings, priced at $39 per person ($29 for food and $10 for beer). Then, on Nov. 3, the Layton MacCool’s will host chef Alan Turner of Snake River Farms/Agri Beef Co., along with representatives of the “Rogue Nation” for a special dinner, with each course paired with selected Rogue brew tastings, such as Brutal India Pale Ale, Juniper Pale Ale, Chocolate Stout and others. The cost is $45 ($35 for food and $10 for beer).